Ayo Derbyshire is finishing his undergraduate degree at the Colorado State University School of Music, studying Horn Performance on a full scholarship with Dr. John McGuire. Ayo is an active freelancer in Northern Colorado, playing in a variety of chamber and orchestral settings. He currently holds the 4th Horn position in the Fort Collins Symphony, and is looking forward to playing in their 69th season. Ayo has been Principal Horn of the CSU Symphony since his first semester as a freshman. In 2017, Ayo was awarded 1st place in the Engelbert Schmid Horn Competition, presented by Siegfriedâ€™s Call. 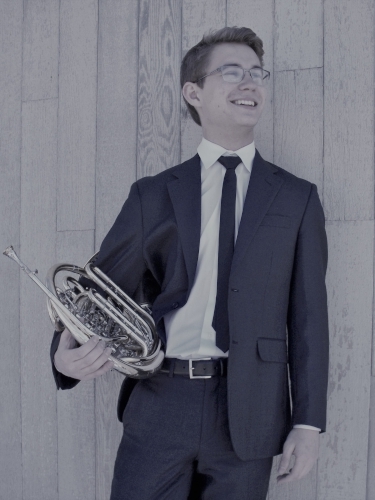 The competition was nation-wide for horn players aged 18-30, and Ayo was judged and selected by iconic horn players such as Phil Myers, William Vermeulen and Leelanee Sterrett. He was also recently awarded the Wendel Diebel Performance Award from the CSU School of Music, in recognition for achieving a high level of performances at CSU. In the past two summers, Ayo has been a Fellow in the Texas Music Festival in Houston, playing different symphonic concerts each week while studying with Houston Symphonyâ€™s William VerMeulen and Rob Johnson. He has also played as a Fellow with the Hot Springs Music Festival and the Denver Young Artists Orchestra.